The weather has been really odd this year and today was no exception. Anyone who was driving through the ice and water in Norwich earlier in the morning would have thought it was December. 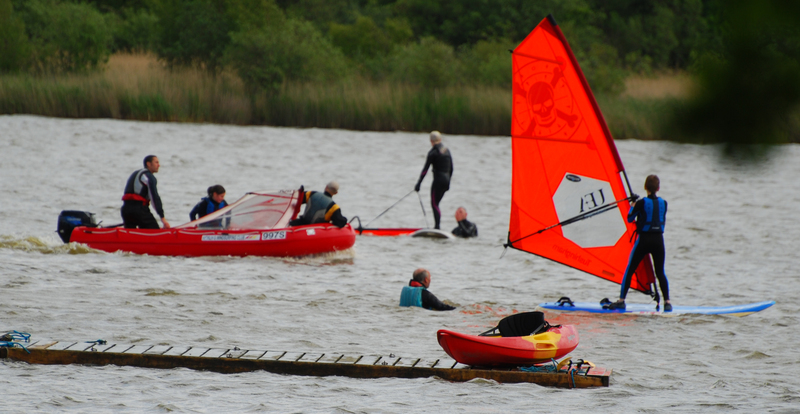 It’s quite amazing that budding windsurfers made the trip to Hickling and took to the water in 20 + mph winds for their first sail. Very satisfying to see everyone doing so well, and in particular the children for showing so much gusto (our future windsurfers?) – wow well done guys. The operation ran like clock work with cakes, tea/coffee, booking systems, changing tents, pontoons and support staff all being in the right place at the right time to put on a show to be proud of. Apologies to those members that turned up for a sail. We realise there was a gap in our communications this year and thank you for bearing with us today. Well done everybody. A cracking good day that everybody seemed to enjoy! Thanks to all the club members who helped out today.